Sinclair College, home to the National UAS Training and Certification Center, is now home to the world's first permanent, custom-built unmanned aerial systems (UAS) indoor flying facility following a ribbon cutting ceremony on Thursday, Dec. 17, coinciding with the 112th anniversary of the Wright Brother's first powered flight. The UAS Indoor Flying Pavilion is the first facility in the world to be constructed and dedicated solely for UAS testing and flight operations. Covering 3,200 sq.ft. and featuring an interior ceiling height of 40 ft., the Pavilion includes a mezzanine flying deck to facilitate testing and instruction, and was constructed to allow GPS signal transmissions to support aircraft navigation. 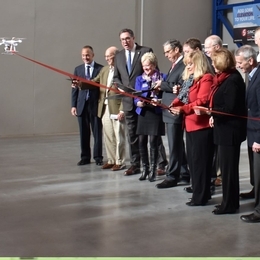 "The new UAS Indoor Flying Pavilion marks another milestone in aviation and another important step for Sinclair in bringing the most advanced UAS capabilities to the Dayton region," said Dr. Steve Johnson, President and CEO of Sinclair College. "Through the remarkable partnerships we've established, Sinclair is leading the way in what's being called by industry leaders as the greatest aviation breakthrough since the first manned flight."